If you are thinking “I want to help youth thrive and succeed with support and safety; and you feel a desire to find ways for kids to be empowered in today’s world. You may even be saying: “I wish I could help, but I don’t know how!” Many entrepreneurial minded people have confessed to me that they feel powerless to help make the world be a better place or how to provide safety for our kids…and there is a bit of overwhelm when recognition that the problem is bigger than any one of us can take on. You could feel better about the future? You get to use your skills and gifts for good? You could feel more connected to your inner essence and core values with confidence and clarity about how you want to show up in the world? You could be empowered to be a contribution with a renewed appreciation of diversity and learning for this brave new world? You were part of a resourceful synergistic network where the power of many align to be the change we imagine as the highest and best for this brave new world? Unfolding your own genius is key in learning to connect with self. 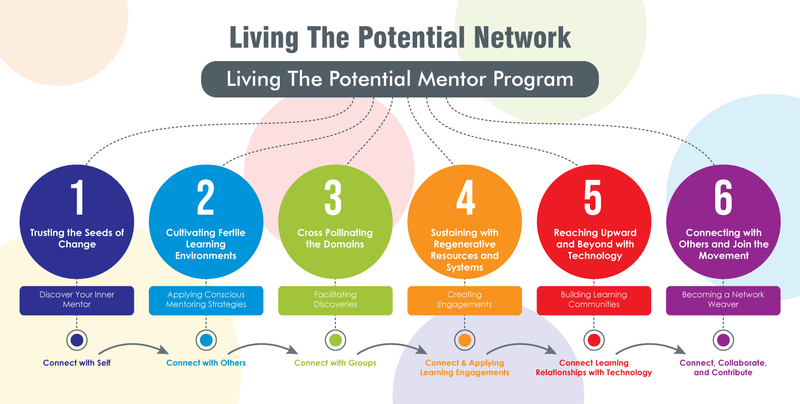 This awareness is necessary in your consideration of becoming a 21st Century Mentor that unleashes potential from the inside out. Let’s face it, we can not really help others if we haven’t reviewed our own learning journey. In this first course, we access your core wiring, that unpacks your true essence, that includes your core values. We inquire about your core strengths and talents- that many times are overlooked due to our earlier programming. Reflection on life as a journey, walking the life spiral opens up new possibilities for shifting self talk and already thinking that may have limited your capacity to design your life with empowered awareness. This process awakens you to release old beliefs that no longer serve, which invites a proactive growth mindset. Feedback from participants shows up as gratitude for the first time being able to witness their own “light” and as a result a regenerated love for life and learning. This inspiration has brought forth the idea-that if more people knew this process, the world would be a happier place. And hope for the future as we are determined to share, learn and grow with others in our intergenerational community.